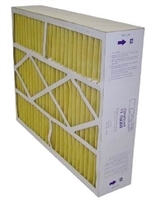 The Basic Allergy filters at Filter Shipping are all rated MERV 11 or 12. 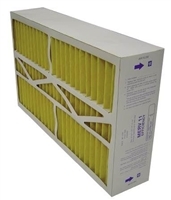 These filters are great for those that suffer from airborne allergies. Breath easier with a quality allergy filter. The basic style allergy filters are easier on your system than the higher grade allergy filters. They have a better balance between air flow and filtration. The majority of systems made in the last decade will easily handle one of these filters. Nominal Size: 14" x 25" x 1"
Exact Size: 13.5" x 24.5" x 0.75"
Nominal Size: 15" x 20" x 1"
Exact Size: 14.5" x 19.5" x 0.75"
Nominal Size: 16" x 16" x 1"
Exact Size: 15.5" x 15.5" x 0.75"
Nominal Size: 16" x 20" x 1"
Exact Size: 15.5" x 19.5" x 0.75"
Nominal Size: 16" x 24" x 1"
Exact Size: 15.5" x 23.5" x 0.75"
Nominal Size: 16" x 25" x 1"
Exact Size: 15.5" x 24.5" x 0.75"
Nominal Size: 18" x 18" x 1"
Exact Size: 17.5" x 17.5" x 0.75"
Nominal Size: 18" x 20" x 1"
Exact Size: 17.5" x 19.5" x 0.75"
Nominal Size: 18" x 24" x 1"
Exact Size: 17.375" x 23.375" x 0.75"
Exact Size: 22.125" x 24" x 5.25"
Exact Size: 19.5625" x 22" x 5.25"
Exact Size: 15.4375" x 21.9375" x 5.25"
Nominal Size: 16" x 20" x 5"
Exact Size: 15.375" x 21.875" x 5.25"
Exact Size: 15.375" x 25.5" x 5.25"
Save on each filter and save on shipping too. Exact Size: 20.25" x 20.75" x 5.25"
Exact Size: 15.875" x 19.75" x 4.375"
Exact Size: 15.875" x 24.75" x 4.375"
Exact Size: 19.875" x 19.75" x 4.375"